Going to my mailbox several weeks ago, I encountered a beautiful silver envelope embossed with the names Tzvi and Esther Fass, and Reuven and Fay Weiss with their respective addresses on the flap. Upon opening the invitation, the reality struck that Bassi was indeed going to be married to Baruch on the eighth of Elul 5778, August 19, 2018. 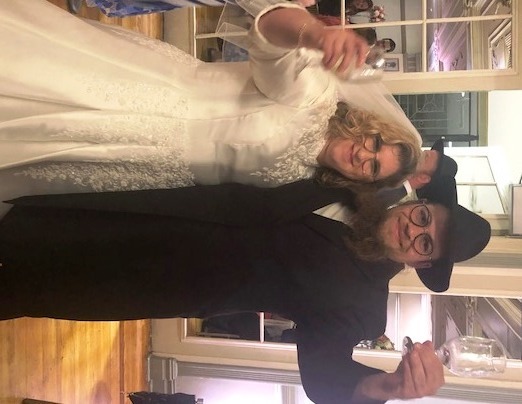 The invitation, crafted in traditional Chabad style, both in form and text, indicated that the wedding would take place at Oholei Torah and the chuppah at the Lubavitch World Headquarters. After returning the invitation to the envelope, I allowed myself several minutes to reflect and reminisce. I first met Bassi some 12 years ago, when she, together with several of her friends, came to HASC Center, after spending three years in Israel at the Darcheinu program for young people with special needs. They were looking for help planning the next stage of their lives. Because of their special needs, they looked to HASC Center in planning the next stage of their lives in terms of residential options and growth opportunities in their educational, vocational, and independent living skill arenas. HASC helped them find a place to live, a beautiful apartment on Ocean Parkway — which became Bassi’s home for the next 12 years — and also helped them find work. Bassi flourished during those years and her cheerful disposition, kind heart, spontaneous sense of humor, and ever-present smile brought her many friends, even as her growing competence and independence helped increase her innate simchas hachaim. Bassi advanced steadily at work. She began as a volunteer office aide at a local Lubavitch Yeshiva, followed by a part-time job at Junees. After that, she was offered work as a teacher’s aide for day campers at Camp HASC in Parksville, N.Y. During her second summer at that job, her outstanding work came to the attention of Shmiel Kahn, executive director of HASC Center and Camp HASC, and he recommended that she apply as a teacher’s aide at the HASC School for Special Children, located in Boro Park. Bassi impressed the people who interviewed her and she was hired as a teacher’s aide where she has worked full-time for the past two years. Hashem works in mysterious ways. Unbeknownst to anyone within Bassi’s sphere, a young man by the name of Baruch had recently made his way up from Miami Beach, Florida, and relocated to Crown Heights. Determined to conquer any special needs limitations and become self-sustaining, he sought employment in the immense Jewish Brooklyn landscape, only to find employment as teacher’s aide at the Hebrew Academy for Special Children School. It was a no-brainer when the match between Bassi and Baruch was proposed, that it represented a resounding fulfillment of their dreams and validation of their accomplishments. Fast forward to the day of the wedding where following the kabalos ponim at Oholei Torah, all assembled at “770,” the traditional location of Lubavitch weddings. The sky was overcast but the subtle droplets of rain could only be construed as heavenly tears of joy in response to this very special union. The chosson accompanied by his parents; the kallah accompanied by her parents; seven circuits around, reading of the Rebbe’s letter, blowing the shofar, siddur kedushin by Rabbi Leib Schapiro, a dean of the Yeshiva Gedola Rabbinical College of Greater Miami; reading of the kesubah by Rabbi Moshe Bogomilsky, followed by the recitation of the sheva berachos. I was given the honor of reciting the first two berachos — not for anything I had done — but as a representative of the many members of the HASC Center Agency, whose hard work, selfless dedication, patient counseling, instruction, friendship, and genuine concern, was extended to Bassi and her family over the years. Returning to the wedding hall, the seudah, dancing, and simchas chosson v’kallah proceeded in a most spirited and exhilarating fashion. As I was leaving the chuppah, one of my HASC Center colleagues shared the following anecdote. The Fasses, baruch Hashem, have two married daughters and each marriage is marked by their wedding picture hanging on the wall. For many years, an empty picture frame hung on the wall as a symbol of the fervent hope and emunah in Hashem’s benevolence that Bassi’s wedding picture would someday fill the frame and signal the realization of her parents’ hopes and dreams. The frame will now be filled with joy and happiness as Bassi and Baruch begin their lives together as husband and wife.